Today VG-EB04: Infinite Phantom Legion and VG-EB05: Celestial Valkyries were announced, revealing two sets introducing long anticipated support for Nova Grappler and Oracle Think Tank. Each of these sets, following the 35-card format of prior extra booster sets, will feature 29/28 key cards reprinted from the clan's past releases plus six new Death Army units and seven Battle Sister units, respectively. Set for a November 17 Japanese release, most prominently the sets feature an Ultimate Lifeform, Cosmolord crossride and a Battle Sister unit receiving promotion on par with Tsukuyomi of BT03. With an English release likely to follow in coming months, the current timing of these two sets could be no better for the international scene, where Trial Decks 02: Golden Mechanical Soldier and 03: Princess Maiden of the Cherry Blossoms are being postponed for later release. 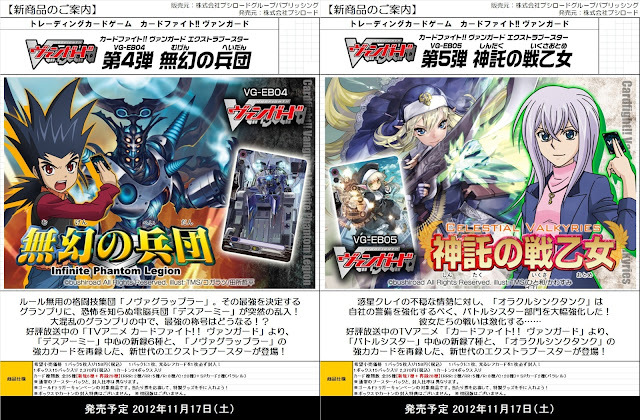 The timing of EB04 and EB05 could point to a similar release pattern between the English versions of TD02 and 03, creating a massive influx of support for Nova Grappler and Oracle Think Tank, and in turn strengthening them in the international metagame. This would be much akin to Granblue's current spread in North America. Past Death Army cards have focused toward supporting Asura Kaiser, trading lower power for self-standing skills and being able to form a 16000 power line when lined up with one another. When used correctly in conjunction with Asura Kaiser, their strategy allows for a total up to five attacks in one turn capable of assailing 11000-power units without the use of triggers. Although this leaves a fairly narrow playing field for new entries in the series, one speculation is that the new Death Army cards will be able to mount more than full-power strikes upon standing, to level the playing field between them and 13000-power crossrides. Most interesting of all is the Cosmolord crossride card. While not technically confirmed by official sources, the artwork for Infinite Phantom Legion is being universally lined up as a crossride to reinforce the 11000-saturated Nova Grapplers. Fittingly, Cosmolord is one of the Nova Grapplers' scarce units that can attain more than 20000 power consistently, particularly through an established combo with Meshrad Roid. Exactly how the crossride will behave is uncertain, but Nova cardfighters can expect to compete with their Kagerou and Dimension Police contemporaries this November. In addition to the praise it's garnered, this announcement also completely dismisses past rumors of a Nubatama-based EB04.